We present hereafter a reference example for the Switched Ethernet Flows Analysis. The objective is to compute the Worst Case Transmission Time (WCTT) of packets sent on a switched Ethernet network such as AFDX networks in avionics systems. 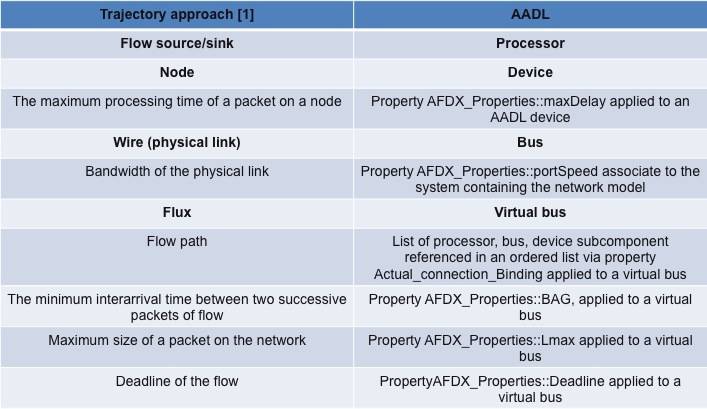 The AADL – AFDX property set has been defined in the scope of the preliminary definition of a “network annex” to the AADL. The SAE AADL standardisation subcommittee conducted this work, which was initiated by ISPRAS (Institute for System Programming of the Russian Academy of Sciences). We list hereafter the set of properties we use to characterise an Ethernet switched network and apply the trajectory approach . After this presentation, we sum up in table 1 the correspondence between these properties and the concepts used in . This way, one can understand better how the AADL – AFDX properties are used to compute WCTTs using the method presented in . The meaning of the properties is given as comments in the properties definition. -- in accordance with the BAG (traffic shaping). -- The Switch should verify the BAG (traffic policing). -- An output port should not transmit frames that are older than "max delay". How to import the project in your workspace? From OSATE, make sure you installed the SEFA (Switched Ethernet Flow Analysis) plugin. Installation instructions are here. If the SEFA plugin is installed, click on “File –> New –> Example…” select “SEFA/SEFA Examples” and click on “Finish”. Two projects are added to your workspace: “reference_example” and “industrial_example”. In the remainder of this page, we work with the “reference_example” project. How to start the analysis? First instantiate the system implementation called main.impl in file SwitchedEthernetNetworkExample.aadl: select main.impl in the “outline” view of OSATE (usually on the right side of OSATE), right click on main.impl and select “Instantiate system”. This action created an instances directory called “instances”, as you can see in your project folder inside the AADL Navigator (usually on the right side of OSATE). In this folder, select file “SwitchedEthernetNetwork_main_impl_Instance.aaxl2″ and in the main menu (at the top of OSATE) click on RAMSES and select “Switch Ethernet Flows Analysis“. As a result of the analysis, an xml file with extension .ares is generated. Open it to see the analysis results. In the reference example, the hardware platform is defined in a system implementation called HW_Platform.impl. Figure 1 provides the AADL graphical representation of this component. As we can see, it is made up of 6 bus subcomponent (bus_1 to bus_6), 3 device subcomponents (switch_1 to switch_3), and 4 processor subcomponents (end_system_1 to end_system_4). These components are connected via bus accesses as illustrated on figure 1. Processor subcomponents represent the computation unit from which packet are sent, or in which packets are received. A required bus access represents a physical port of the computation unit, to send or receive packets. Device subcomponents represent ethernet switches on which packets are routed. Here also, a required bus access represents a physical port of the switch. Bus subcomponents represent ethernet wires that connect computation units to switches, and switches to switches. In addition to the network itself, presented in the previous section, we need to represent packets path in this network. In AADL, a network route can be represented with a virtual busses, and its binding to a list subcomponents in the network. For those who know about AFDX networks, a virtual bus here represents an AFDX virtual link. 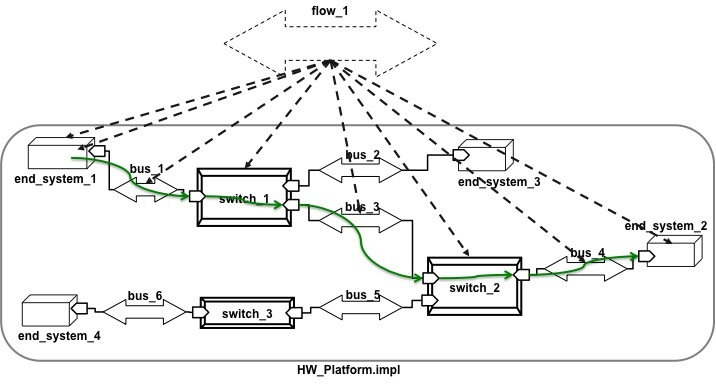 In the reference example, 3 virtual buses are defined (flow_1 to flow_3). Figure 2 provides a graphical representation of flow_1. Last but not least, the packet flows must be characterised in terms of bandwidth usage, time to traverse a switch, a bus, etc. This is done using the properties defined in section “Useful subset of the AADL – AFDX property set” at the beginning of this page. Table 1 provides a synthetic correspondence between concepts used in the trajectory aproach  and AADL modelling elements. Improving the Worst-Case Delay Analysis of an AFDX Network Using an Optimized Trajectory Approach. H.Bauer, J.-L.Scharbarg and C.Fraboul. In IEEE Transactions on Industrial Informatics.